Like a playground in the heart of Southern California’s Coachella Valley, for decades Palm Springs has offered an escape for families and couples seeking desert serenity, relaxation, and vacation fun. 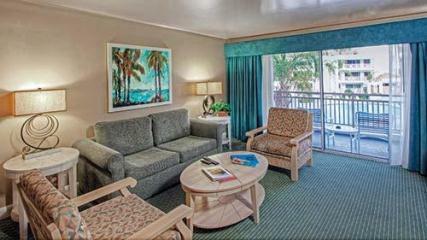 And within this idyllic setting, there’s no better retreat than Diamond Resorts Palm Canyon Resort. Enveloped by tropical landscaping, these Diamond Resorts timeshares will tempt you like an oasis in the desert, perfect for vacations designed for relaxing by the resort’s massive pool, shopping and museum hopping, golf, biking, and exemplary casual and fine dining. And that’s only the beginning. 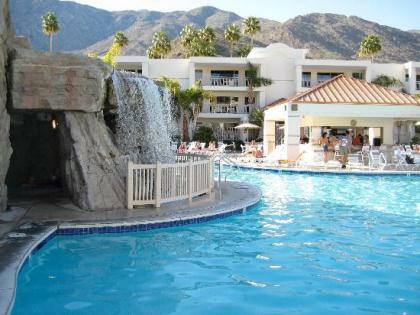 In an area known for luxurious and pampering spas, casinos, nightclubs, and a vast array of outdoor sports, you can escape to Palm Springs and the Diamond Resorts Palm Canyon Resort over and over again, loving it more each time you vacation there. How happy will your family be, playing in 1.5 acres of swimming pools, with a sun deck, cascading waterfalls, grottos, waterslides for both children and adults, a children’s pool, and an in-cave whirlpool spa? Now add in basketball, billiards, a fitness center, aerobics classes, a game room, a picnic area, a pool table, a sauna, on-site spa, volleyball and yoga classes, and it’s clear that vacationing in Diamond Resorts timeshares means you will never run out of fun to keep you busy. On property, you will also enjoy the peace of mind that comes with 24-hour security, and the convenience of onsite concierge services, a maintenance department, housekeeping services, safety deposit boxes, beach towel service, vending machines, and free Wi-Fi in the resort lobby or paid access Wi-Fi in your timeshare villa. Although all of the timeshares at Diamond Resorts Palm Canyon Resort include a partial or complete kitchen, Diamond owners also appreciate the resort’s café and coffee shop, a poolside bar, a bar and cocktail lounge, a full service restaurant, and room service. Junior villas are available in two floor plans, the smaller being designed for two vacationers and including a mini-kitchen, while the larger villa accommodates up to four vacationers and includes a queen sleeper sofa (in addition to the queen size bed), a partial kitchen, and a balcony, patio, or terrace. The 1-bedroom timeshare villa at Palm Canyon Resort offers two king or queen size beds, a sleeper sofa, a full kitchen, and a balcony, patio, or terrace. A 1-bedroom plan is designed to sleep four to six vacationers. The 2-bedroom timeshare villa floor plan includes all the features of the 1-bedroom unit, plus a second private bedroom with either twin beds or a queen size bed. Maximum occupancy for this plan is four to six vacationers. A 3-bedroom lockoff floor plan is also available, created by the combination of two smaller units. This plan offers private accommodations for six but has a maximum occupancy of ten vacationers. 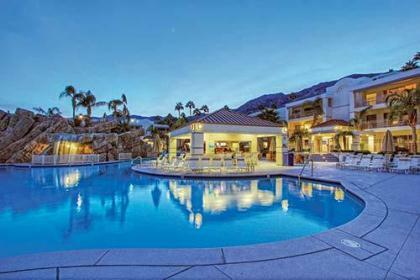 Although the Palm Canyon Resort is a well-established property, it is a new acquisition for the Diamond Resorts timeshare and vacation ownership family. As in any commercial property transition, changes are underway, many involving the upgrade of select resort amenities and features at Palm Canyon Resort. If you are considering buying Diamond Resorts timeshare, now is an excellent time to look at timeshare resales at Palm Canyon Resort. To find out more about buying, renting, or selling Diamond Resorts Palm Canyon Resort timeshares, contact a specialist at BuyaTimeshare.com. Contact Diamond Resorts Palm Canyon Resort Specialist Today!